Today is the one-year anniversary of the delivery of my Samsung Chromebook, the first commercially-available laptop with a stateless operating system. So how did it go? I'll do this in bullet points, ending with a few about what's going right with ChromeOS, and why many people still don't understand what's going on here. 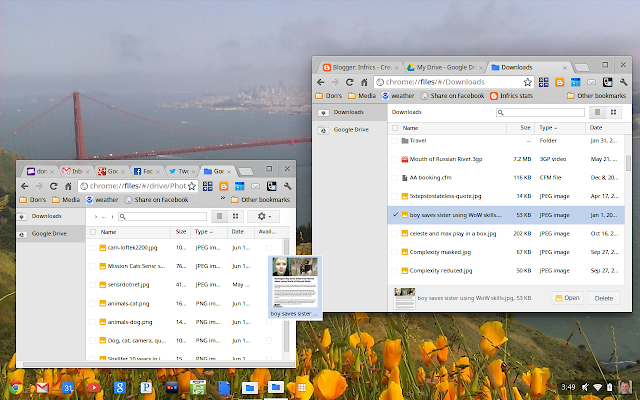 --The best thing I can say about ChromeOS is that I haven't used anything else for the whole year. There are a few exceptions: I've booted up my Windows laptop to use Skype, because some friends and I use it to stay in touch; there is no Skype version for ChromeOS. That's more habit than anything else, Google Chat and Google Voice are fine substitutes, but the friend I talk with most often has trouble getting them to work on his Mac. I've occasionally needed to create or edit something in Microsoft Office-compatible formats, and the locally-installed version of OpenOffice on my Windows computer still does that a little better than Google Docs. Since June 15, 2011, everything you've seen on Infrics.com has been written, formatted, and published from my Chromebook. --Although I'm still using the same machine as a year ago, ChromeOS has grown into a completely new operating system in that time, with windows, a taskbar, drag-and-drop file ability, and as of today, even a desktop I can customize with my own images. ChromeOS did another of its silent, in-the-background updates yesterday, and new features appeared like magic. Notice that my own photo of the Golden Gate Bridge is now the desktop. --One of the biggest challenges I faced a year ago was that ChromeOS didn't have a cloud-based equivalent of the familiar C:/ drive from my old computer. I could--and sometimes had to--store things locally on the flash drive. It's still there, but in the Developer-mode version of ChromeOS I'm running, storage is now fully cloud integrated with Google Drive. I can save to, attach from, rename, delete, and drag-to-move files on the cloud directory as easily as those stored on my local machine. Or from one to the other, as shown in this screen capture. Looks familiar: dragging a file from local storage to Google Drive, using windows on a desktop. --I've never once been interrupted by a nag screen to update anything, or a virus scan that needs to run; neither of those is needed or possible on ChromeOS. --The "what will I do if I have no internet" fear turns out to be unfounded. WiFi is almost everywhere, and when it's not, I use the built-in 3G Verizon connection, prepaid at 100mb/month free for two years. Even though 100 megs is practically nothing in today's use patterns, I've never once used up the entire allotment in a month. --Improvements to the user interface (UI). The windowing environment is familiar and comfortable. But it's all rendered using browser technologies, and has all the inherent benefits of a stateless OS. It just LOOKS like other operating systems. I can take a sledgehammer to this machine, and not lose a thing; all I need do is sign on to a new one, and my whole world is there at once. No other OS can make this claim, and it's huge. --Upgrades to file management that reduce the need to store anything on the local machine. --Improvements to web applications and Chrome extensions that extend the value of the "world from the cloud" experience. The Google Docs suite of products is getting better--a lot better--all the time. There are more and better web apps every day, like the whole suite of photo and audio tools now available from Aviary.com. --New ChromeOS computers that use increased power to improve the UI in resolution and speed. The heart of the stateless idea is that the local machine provides connection to the cloud and the elements of a good UI experience; that's where you can add bells and whistles with good effect. What people still don't "get." --Complaints about the ability to run applications locally. They miss the point: you use a stateless OS so that you don't need local apps at all. Google has added offline viewing of documents and e-mail, and ChromeOS has always had the ability to display .pdfs, play stored audio, and show locally stored images when not connected. But each of those is geared for what turns out to be a very small number of cases, and the number of times when the ability to run offline apps is truly needed is growing smaller by the day. Working to make the offline experience on ChromeOS more like a legacy computer is wasted energy at best, a betrayal of the stateless promise at worst. --Comparisons to Windows-this or Mac-that. Microsoft and Apple are battling each other to make a better steam locomotive, while the stateless future is one of jets and rockets. Fat OSes are just plain old-fashioned now, they are only relevant because of legacy, not because of need. If I were AAPL or MS, I'd fight to perpetuate my fat operating system, too. But I consider that battle to be essentially over, and they both lost. --The idea that ChromeOS devices should be cheap. I have to confess to mixed feelings about this; yes, you need less machine to run the stateless world, that's a big part of the stateless appeal. Some stateless devices should be so cheap as to be practically throwaways, but some may be very elegant expressions of personal taste, status, and professional standing. Today, we're somewhere in the middle. But it does appear clear that the initial prices we're seeing for new-generation Chromebooks reflect the ability to get people to pay more in order to say "look, I'm first." Look for prices to drop within 6 months. Clearly, I have a point of view here, and it's on the side of any stateless device. But I don't arrive at those feelings out of thin air. For a look at the Infrics.com complete coverage of stateless, click the Stateless Future tab on the page header. More soon. Please let me know of your own experiences, or your thoughts about ChromeOS and stateless, either in the comments, or e-mail, or message me on Google+. I've been following the concept of a "Chromebook" since the start. I read reviews, watched unboxing videos, ran ChromiumOS in a virtualbox, etc. This week I decided to take the leap of faith and purchase a Samsung 550 (3G) model. I think you've nailed all the key points. I will say that ChromeOS is not yet ready for mainstream adoption in my opinion, but we'll get there. As the globe gets more mobile, there will be a major push for throwaway devices that store all data and settings in the cloud. When the world is ready, Chromebooks will be as well. Exciting times! I've been hoping for the "network" computer since I got started building computers in 1989. not entrirely a new concept, but i think a sound and now practical way to do computing. I was one of the lucky ones to be part of the CR-48 Chromebook pilots and your article is one of the few that "gets it."